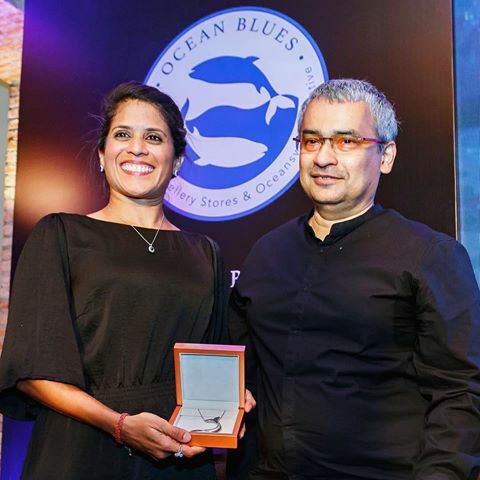 Colombo Jewellery Stores ( CJS) launched its collaboration with Dr. Asha de Vos and Oceanswell, for the protection of Sri Lanka’s oceans, recently at Galle Face Hotel. Inspired by the colors and textures of Sri Lanka’s ocean waters, CJS uses its newest collection, Ocean Blues to raise awareness on marine conservation, working with Dr Asha de Vos and Oceanswell. Already well known for its pioneering tradition in the creation of high quality gem and jewellery collections, the luxury brand of CJS has developed a strong reputation for using its brand awareness to inspire social conscience for environmental issues. This year it hopes to raise awareness about the importance of protecting our oceans by partnering with Sri Lanka’s first marine conservation research and education organisation, Oceanswell. Oceanswell was founded in 2017 by international award-winning marine biologist, ocean educator, National Geographic Explorer and pioneer of blue whale research in the Northern Indian Ocean, Dr. Asha de Vos. CJS will collaborate with Oceanswell on three projects, focusing on marine conservation research and education, in line with Oceanswell’s mission. With the first of these projects called “Eavesdropping on Our Oceans”, Oceanswell will collaborate with fishermen, to understand the impacts of increasing ocean noise levels on local whale populations, in order to answer important scientific questions that will feed into policy decisions, and increase local awareness and engagement. Local students will be trained in acoustic monitoring techniques to build capacity and generate interest in scientific fields that are currently undeveloped in Sri Lanka. The collaboration will also create an information booklet for whale watching tour operators, where there has been little done to increase the educational capacity of operators, despite the rapid explosion of whale watching in Sri Lanka. This educational component can vitally contribute to the protection and conservation of ocean environments where whale watching operates. The third project focuses on skills-development for individuals seeking careers in marine conservation, by developing transferrable skills that prepare students and ocean-based entrepreneurs to work on marine environment solutions. Despite the ocean covering 70 percent of the planet, employment in the field of marine conservation is still low. CJS seeks to capture the dynamic beauty of the ocean, whilst at the same time highlighting the urgent need to protect its fragile ecosystems. The Ocean Blues collection pairs the aquatic hues of blue sapphires, aquamarines and emerald cabochons, with the surf-white brilliance of diamonds and pearls to create the classically nautical blue-white combination that is so synonymous with the sea. The jewellery designs are elegantly powerful, some following the graceful lines and geometric patterning of sea shells. Other pieces made from multi-coloured gems, reflect the warmer colours of the ocean, as seen in its coral reefs and timeless sunsets.